Last Turkey Day, Netflix gave fans of bad movies and wisecracking robots something to be thankful for, renewing Mystery Science Theater 3000 for a 12th season. 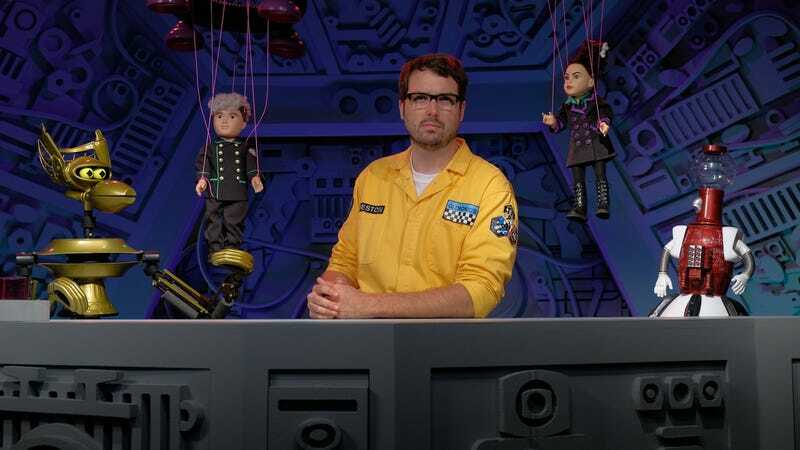 It was a fitting choice, extending the show’s Kickstarted revival on a date that’s long been synonymous with MST3K marathons and premieres. And now, like the aunt who’s perfecting her stuffing recipe well in advance of the big meal, the streaming platform has done it again: The A.V. Club is the first to report that new episodes of MST3K will arrive on Netflix this Thanksgiving—Thursday, November 22—marking the show’s third decade of riffing. When last we left the intrepid crew of the Satellite Of Love, test subject Jonah Heston (Jonah Ray) had been temporarily relieved of his outer-space captivity and threatened with a buzz-capturing marriage to his captor, Kinga Forrester (Felicia Day). Fortunately (or unfortunately), a lovesick TV’s Son Of TV’s Frank (Patton Oswalt) sicced a giant metal serpent on Jonah, bringing the wedding to an abrupt end and stranding Jonah’s robot friends (voiced by Baron Vaughn and Hampton Yount) in orbit above the dark side of the moon. All five cast members are confirmed to return for season 12, so we’ll presumably get an explanation for how Jonah escaped the belly of the beast. Either way: Being eaten by Reptilicus Metallicus is still better than a life of watching cinematic stinkers, right? Ahead of the new season, Hodgson and Ray will hit the road for a 30th Annniversary live tour, which begins in Portland, Maine on October 9. (Tickets for the tour are on sale here.) Until then, whet your appetite for fresh MST3K content with these exclusive photos from the set of season 12. Jonah’s either doing some Friars-style roasting here, or he’s asking Crow to pull his finger.